A guest Friday fold rolled into my email inbox last Friday. It’s a beaut! The attached photo is one of several I took while hiking a canyon near my house in Utah. I wasn’t able to include a scale object because the photo was taken from the opposite side of the canyon, but my best guess from looking at maps and satellite images is that it’s probably about 500 ft across. The rock is pre-Cambrian quartzites and slates. As a non-geologist, I’d like to say how much I appreciate your blog, by the way. Often when I read geology blogs I find the illustrations really confusing; they’ll post a picture that says “Look at this amazing example of a [name of feature]!” without indicating where it is in the photo or how I can tell it apart from everything else. (Admittedly, I may not be their target audience.) I love that you take the time to put lines, arrows, etc. on your photos and explain them clearly and unambiguously, so that even an English major can understand what you’re talking about. 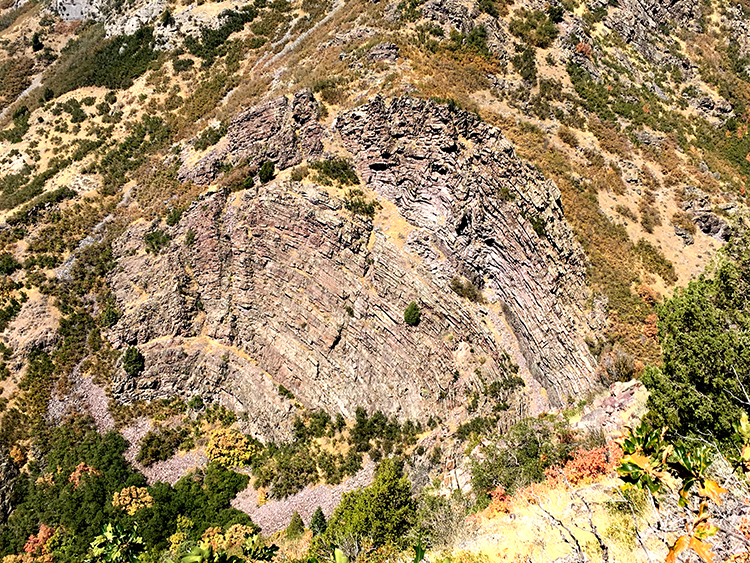 Thanks for sharing this cool photo of a cool fold, Octavia, and thanks for the laudatory comments about the power of annotations to “show what a geologist sees.” Happy Friday!